Express lanes will function in the same fashion as the ones already in operation on Interstate 580 between Livermore and Pleasanton. Bob Redell reports. Drivers hoping to skirt traffic along Interstate 680 in the Tri-Valley only have a few more days before they will have to pay for it. That's because high-occupancy toll lanes, or HOT lanes, between Dublin and Walnut Creek will officially open at 5 a.m. on Monday. "It is expected to reduce congestion and to provide a more reliable trip for everybody in the corridor, but it is not going to eliminate congestion," John Goodwin from the Metropolitan Transportation Authority said. When it comes to pricing, that will depend on demand, according to the MTC. A minimum toll amount could only cost drivers 50 cents, but there is no official maximum. The charge will be priced in a way to try to guarantee that drivers will be traveling at a minimum of 45 mph speed in the toll lane. 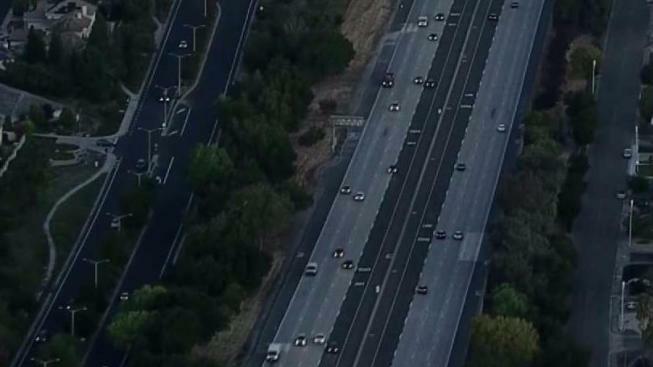 The toll lane in the northbound direction will span roughly 11 miles between Alcosta Boulevard on the border of San Ramon and Dublin and Livorna Road on the northern edge of Alamo. The toll lane in the southbound direction will traverse 12 miles of roadway from Rudgear Road in Walnut Creek to Alcosta Boulevard. Drivers interested in taking advantage of the new toll lanes will need a FasTrak device. Officials recommend that drivers use the FasTrak Flex device, which allows drivers to indicate how many people are in their car with the flip of a switch. Having two or more people in a car with the transponder or having a clean-air vehicle in general does away with any toll. Future high-occupancy toll lanes are slated to come to Interstate 880 between Oakland and Santa Clara County by the end of 2019.